What do you think CVR Partners will announce as their distribution for the fourth quarter of 2012? The company reaffirms its expectation for 2012 full year distributable cash flow in the range of $1.70 to $1.80 per common unit. So we have guidance for the full year, how much have they distributed for the first nine months? So the total for nine months was $1.619 compared to the recent guidance of $1.70 to $1.80 for the full year which indicates that the fourth quarter distribution will be in the range of $0.081 to $0.181. Most sources that show a “Dividend Yield” for UAN are showing it around 7.5%, which is based on the sum of UAN’s last four distributions (which total $2.207). Keep in mind that UAN is a Variable Rate MLP so its distributions will go up and down based on each quarter’s distributable cash flow. You now have an estimated range for the fourth quarter distribution, what do you think current holders of UAN units will do once they announce the distribution? Especially all people who have bought units since the start of 2013? Is a lower distribution priced in to the unit price? UPDATE 1/24 4:17PM: UAN just announced a distribution of $0.192 for the fourth quarter, so they can say they “exceeded guidance,” market reaction TBD tomorrow morning. 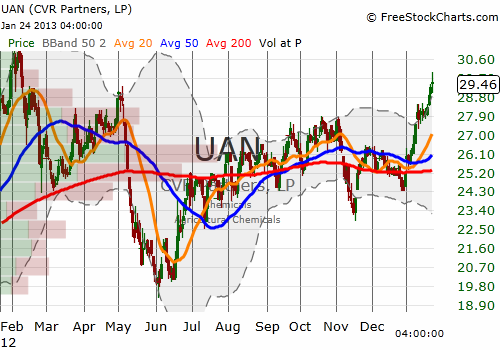 UPDATE 1/29: I sold one tranche of UAN puts today for a 102% gain because it seems like most of the surprised sellers exited in yesterday’s high volume. And sold the second tranche for a gain of 75%. All excellent points. Yes the estimate that UAN had in its IPO prospectus was that approximately 50% of its distributions would be tax deferred (so I use 50% in my analytics). UAN is also set-up to have Variable Distributions which is a much different risk profile than say Kinder Morgan. And I use the highest possible tax rates that are in place now when coming up with my estimates for Forward Yield After Tax (so the 43.4%) for all the MLPs, which of course also takes into account the estimated portion of the distributions that will be tax deferred. UAN is an interesting situation, but a very low percentage of its distribution (I think only 50% or 60%) is a tax deferred return of capital. The rest is taxable at one’s highest marginal rate ( up to 39.6%) plus if the unit owner filing jointly has income of $250,000 or more another 3;8%, for a total of about 44%, plus the PEP and Pease phaseouts if the income of the unit holders are $300,000 or more. I would rather own a less attractive MLP with a safe distribution of which 80% or more is a tax deferred return of capital. Thanks Joe. I guess we’ll see if everyone buying up UAN from $23.75 after the 3Q12 distribution in November to $29.44 at yesterday’s close (up ~24%) had the same expectations. I did not expect a large distribution, had to follow the company guidance. It depends on the market reaction once it opens tomorrow morning. If the lower announced distribution causes a bunch of sellers who did not expect it then I’ll sell the puts for gains. On the other hand if everyone who bought UAN so far this year expected an 18 cent distribution the price may go up and I’ll exit my put position for a loss. It’s really small exposure so not going to make a big impact to me either way. I actually posted a comment on a Seeking Alpha article asking for any views on both RNF and UAN 4Q12 distributions to try and gauge what people were expecting but never got any responses. What will you do with your puts?